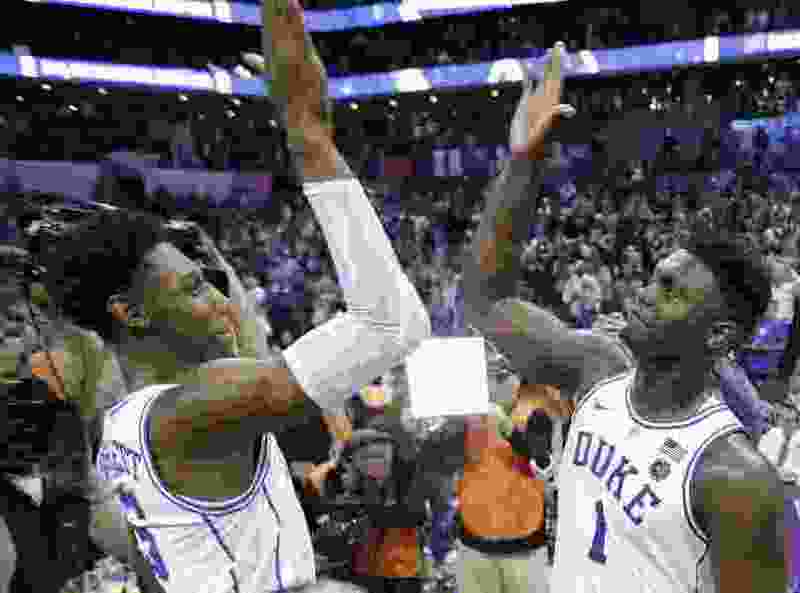 The Blue Devils lost just two games when phenomenal freshman Zion Williamson played significant minutes — to Gonzaga back on Nov. 21 in the Maui Invitational final and to Syracuse at home — and avenged the loss to the Orange and two regular-season losses to North Carolina in the ACC Tournament. Williamson was 13 of 13 against Syracuse and 13 of 19 against the Tar Heels. Don’t laugh. The Ivy League tournament champion beat Harvard 97-85 for the title on Sunday and could give scandal-plagued LSU all it wants in the first round. Yale features NBA prospect Miye Oni and can score with anyone in the tournament, having averaged more than 80 points a game. This might not be the closest, or most competitive, matchup, but it is easily one of the most intriguing, as Minnesota coach Richard Pitino faces the team that used to be coached by his father, Rick Pitino. The Golden Gophers showed upset potential in the Big Ten tournament, while Louisville has proved to be both vulnerable and explosive at various points of the season. The top overall seed’s best player is a 6-foot-7, 285-pound forward whose thunderous dunks and highlight-reel plays have captured the attention of the nation this season — when he hasn’t been sidelined with a knee injury. Most are saying he will be the first overall pick in the 2019 NBA draft if he leaves Duke after just one season. The Tar Heels lack a marquee player such as Williamson, but might be the top all-around team in the tournament, evidenced by how they handled Duke twice in the regular season when Williamson was sidelined for all but 36 seconds. Cameron Johnson (16.9) is UNC’s leading scorer, while Luke Maye (10.5) is the top rebounder and Coby White (4.2 assists) is one of the best guards in the country. Having won the WAC regular season and conference tournament championships, the Aggies are easily one of the hottest teams in the country. Their schedule was weak, as usual, but their roster is loaded with athletic playmakers. NMSU doesn’t have a big-time scorer, but is as balanced as any team in the tournament with six players averaging 7.5 points or better. The seventh-seeded Terriers have won 20 straight games, last losing back on Dec. 19 at Mississippi State, and feature 20-point scorer Fletcher Magee, a deadly outside shooter. But Seton Hall is also hot, having made it to the Big East tournament final before dropping a heartbreaker to defending national champion Villanova. With apologies to local favorite Sam Merrill of Utah State, arguably the state’s top player, the nod has to go to North Carolina’s White, a guard who is averaging 16.3 points, 4.2 assists and 3.2 rebounds. More importantly, White makes the Tar Heels go, along with fellow stars Luke Maye and Cameron Johnson. The Cavaliers drew national attention last year when they became the first No. 1 seed to lose to a No. 16 seed, but they’ve bounced back nicely under the direction of coach Tony Bennett. Defense is still their calling card, but junior guards Kyle Guy (15.6) and Ty Jerome (13.0) and sophomore wing De’Andre Hunter (15.1) make them more potent offensively than a year ago. As Utah learned Thursday night, Oregon plays outstanding defense and probably has just enough scoring weapons to make a decent run. The Ducks wouldn’t have gotten in if they hadn’t won the Pac-12 tournament, but they received a favorable draw — Wisconsin is battling injuries — and have to travel only to San Jose, Calif., for a first-round game. The Gaels execute their offense as well as any team in the country and have slowly improved after a rocky start. Having stunned No. 1 Gonzaga in the West Coast Conference tournament championship game, coach Randy Bennett’s club won’t be intimidated by defending national champion Villanova or playing thousands of miles away from Moraga, Calif., in Hartford, Conn. The SEC’s 2017-18 Player of the Year got more help this season in the form of teammate Admiral Schofield, and others, so his numbers were slightly down. But the 6-7 forward is a big reason for the Vols’ great season and he averaged 19.3 points, 7.7 rebounds and 3.3 assists per game while shooting 57 percent. The Zags are headed back to Salt Lake City, the same site where they launched their run to the national championship game in 2017, but without a West Coast Conference tournament title in their back pocket. After getting upset 60-47 by Saint Mary’s last Tuesday due to its worst offensive performance of the season, coach Mark Few’s club vowed to regroup quickly. Murray State features the best player most folks have never heard of, flashy playmaker Ja Morant, and should be able to stay with Marquette, perhaps pull off the mild upset. Morant averaged nearly 25 points and 10 assists per game, while also grabbing 5.5 rebounds. He’s got a chance to become the darling of the tournament, if the Racers can make a run. Nevada looked like a Final Four candidate for much of the season, but faded a bit late — losing to Utah State in the Spectrum, among other stumbles — and looked a bit disjointed in the Mountain West tournament. Florida is dangerous as a No. 10 seed, despite its pedestrian record (19-15). The winner likely sees Michigan in the second round. Gonzaga forward Rui Hachimura was voted the WCC’s Player of the Year by the league’s coaches, but those who followed the Zags closely say the 6-8, 210-pound Clarke is the straw that stirs the drink. Not only is the transfer from San Jose State a scoring (16.5) and rebounding (8.4) demon, he’s also one of the best defensive players in the country with 102 blocks.